WASHINGTON (CNN) -- For Erich Scherfen, being on a government terror watch list isn't just a matter of inconvenience. It could end his career. 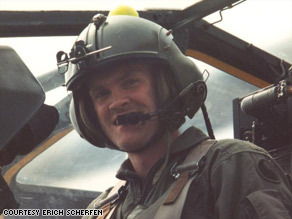 Erich Scherfen served 13 years in the military, including flying National Guard helicopters. Scherfen served in the U.S. military for 13 years, as an Army infantryman in the first Gulf War and then as a helicopter pilot in the National Guard. After receiving an honorable discharge, he was hired as a pilot by Colgan Air Inc., a regional airline operating in the Northeast and Texas. In April, Colgan informed Scherfen that he was on a government list and would be suspended from his job. He was told he faced termination on September 1 unless he was able to clear his name. But Scherfen, of Schuylkill Haven, Pennsylvania, has been unable to do so and said he fears that it could mean he has no future as a pilot. "My entire career depends on me getting off this list," he said. "I probably won't be able to get a job anywhere else in the world having this mark that I'm on this list." Witold Walczak, an American Civil Liberties Union attorney representing Scherfen and his wife in a lawsuit, calls the government actions "unfair" and "unjust." "It is quite clear when the government does something that takes away not just your job but your occupation, your career, they have to provide you with some means to clear your name," Walczak said. iReport.com: Are you on a government watch list? The lawsuit, filed this week in federal court in Pennsylvania, asks the U.S. government to remove Scherfen and his wife, Rubina Tareen, from any watch lists or databases that inhibit their travel. Scherfen and Tareen have both been stopped when traveling and told by security personnel that they are on "a list." Scherfen calls it "embarrassing." Tareen said she thinks they may be on a watch list because of their Muslim faith and her Pakistani heritage. The two said they are not terrorists and don't associate with people who are. "I have no idea why I am on the list, and they're not telling officially that I'm even on the list," Scherfen said. iReport.com: Are you on the list? In a statement, the U.S. Justice Department said it will not confirm or deny that the couple's names are on a watch list for national security and privacy reasons. In May, Scherfen and his wife wrote to the Department of Homeland Security, asking for help with their case. The department referred them to the Transportation Security Administration's Traveler Redress Inquiry Program. This week, they received a number to track their case, but their complaint has not been addressed. A TSA spokeswoman said the agency is seeking "a meaningful resolution" to the couple's case but said there is no timetable for doing so. Meanwhile, a federal judge has the case under review. He asked that Colgan move Scherfen's termination date to October 1. The airline has done so, allowing more time for a possible resolution. "Unfortunately, it is a problem that is shared by countless individuals who have no connection to terrorism, have no connection to crime and don't belong on this list," said Walczak, the ACLU lawyer. Walczak acknowledged the need for the government to protect the country from threats with a watch list but said, "The problem with what the government is doing is that they really don't care about innocent casualties." Scherfen said the pain of his situation is accentuated by the fact that he spent 13 years in uniform protecting the country. "We served honorably," he said. "We served in a war. And they're thumbing their noses at us, basically, and that makes me feel ... really sad about this situation."